alienjesus wrote: Just for the record, the gamecube and wii control sticks have OCTAGONS around the outside, not hexagons. (/pedantic mode). Personally, I've never had any problems with the hexagon stopping precise smooth movements. If anything I find that Nintendo's control sticks are the most precise. I need to go back to Geometry Math 101. 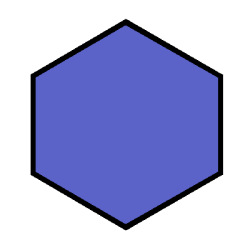 It is an Octagon! Fixed previous pages. Trivia aside, the main point or corners of my dislike of the edges. For games such as Nights Journey Into Dreams, a smooth circular movement is needed. CRTGAMER wrote: For games such as Nights Journey Into Dreams, a smooth circular movement is needed. You can get smooth circular motion with a GC controller. It makes a terrible racket when you do it very quickly however. Each time you hit a corner the stick makes a loud click. CRTGAMER wrote: I'm curious about your Mod, can you post a couple of pics? Okay now I am very curious of the end result! Post a pic when you can please, maybe borrow somebody's camera/memory card reader? Maybe even add a mini guide on how you set up the template? I have not found a Gamecube controller adapter for the PS2 console, not sure if one exists. There is one for the PC though, a USB connection. Now that makes for a rough flight, Forlorn Drifter's mod might be the answer. That or the Mayflash PSX adapter and a Duel Shock. Voice in an old C64 game wrote: Another Visitor! Stay a while, stay forever! Not Mission Impossible, but a remake of a classic Commodore 64 computer game. It has three modes; the Remake, the Original and a mix of graphics of the old and new. The original C64 version is also available on Virtual Console. Amazing this game managed to get a pressed disc release, usually Retro style games only appear as a download. The voice on the game is a little different, not the raspy original. The Dialog is the same; "Another Visitor! Stay a while, stay forever!" Only the remote is used. Hold the Remote in a regular "point" position and use the DPad to move. The A or B is used to jump. To access a Computer Terminal, stand in front of it and push up on the DPad. Access a Pocket computer anywhere with the + button. While in either the Terminal or PDA, a cursor appears which is controlled by pointing the remote. I am disappointed that the Remote does not have an option to be turned sideways, the Remote held as a NES Pad just seems more nature for platform games. Maybe more sensible to keep it in the normal position since continual computer access functions require pointing at the screen. Dragging items on the screen is more intuitive with a "Mouse" control of the Remote. A side track mini review of the Gameboy Advance cart the Spy is staring at in the picture below. A remake and original mode of another classic C64 game. 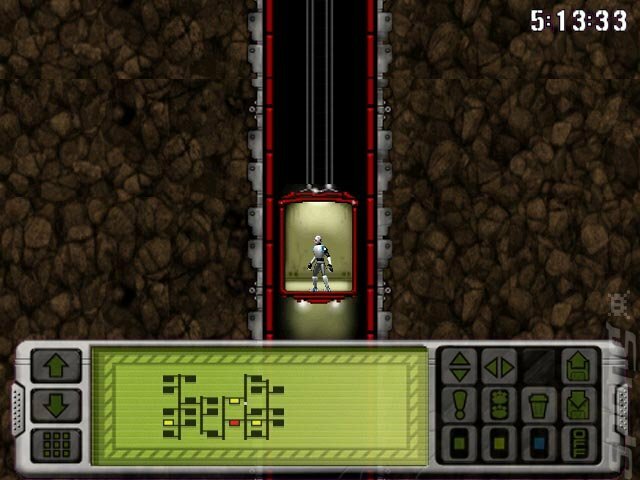 Move a character named Rockford underground like Mr Do or Dig Dug. Collect the diamonds while avoiding rocks. Unique in that sometimes rocks will fall when cleared on the sides and not just from the bottom. The other goodies in the pic are an EPYX 500XJ with solid Micro Switches inside and a FastLoad cartridge. The EPYX Joystick is designed for a comfortable fit with the fire button right at the handhold, most square based joysticks of the day were notorious as not very ergonomic. The FastLoad speeds up C64 floppy disk loads four times faster, a very useful cart for Commodore owners. 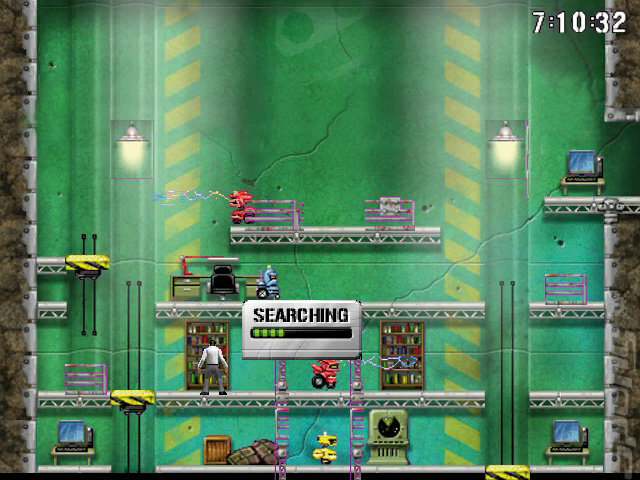 Search rooms to find passcodes to prevent a doomsday missile launch, you can tell this game is from a bygone era! The game is difficult but at least there are unlimited lives. However, every time you get killed the countdown clock is reduced. Take elevators and run thru various rooms and search the furniture in each room for passcodes. Security Robots block your way, your only defense is to jump over them. Some robots move slow, some fast and some shoot electrical charges. As passcodes are recovered, use the pocket computer to unscramble them. After nine sets of passcodes are unscrambled and assembled, find the main terminal hidden in one of the rooms. Look for the red room on the map while at the elevator, meanwhile the clock is ticking. Sometimes a Robot Code or Reset Lift can be found, use a computer terminal to activate. A strategy of saving the limited codes for difficult rooms or searching the one last piece of furniture in the immediate room. There is a "Music Room" that has a large checkerboard on the screen. Match the tones, not the pattern sequence Simon style to receive Robot Snooze or Lift Reset codes. This game originally appeared on the Commodore 64. There is a short history section in the game manual which I attached here. A shame there is no mention of the 500XJ Joystick or EPYX's greatest achievement, the C64 Fastload. The 500XJ was released for the Atari 2600 and NES, both have very nice tactical click micro switches inside. A great remake with an exact to the original C64 mode. Also a very hard game the puzzle pieces are hard to put together. The game should have a controller option to flip the Remote NES Pad mode. A Classic Controller option would have been nice too, to play the game with an Arcade stick. However, the remote DPad is workable and the "Mouse" function of the Remote dragging pics is a good feature over the original C64. The Commodore 64 original version has one distinct advantage. The Cheats! Looking over my precious Corish Computer Game Guide, a lot of Pokes and Peeks for no Spirite Collision which basically makes you invisible to the Security Robots. Now if only a way to enter the commands for the Wii version. I already plan on direct wiring a Remote to a Tatsunko Capcom Arcade stick. I disassembled an older non Motion Plus Remote to see if this is feasible. The pads can easily be jumped, but to maintain Remote functionality, I have to find the traces. Very tricky, looks like two layers in the PCB with very tiny solder points. If I can get the Remote NES Pad layout to work in the Arcade Stick, incorporating vertical DPad games is simple. An extra Quad Pole Toggle Switch could be added to flip the DPad around. This will be worth adding depending how many games I find that use the remote DPad in the vertical position. In addition, a 9 pin Atari joystick input port could also easily be added, piggy backed over the Arcade Buttons. 2600 joysticks have no PCB inside, a simple matchup of each switch. It would be a kick to pull this off, play Impossible Mission on the Wii with the 500XJ Joystick. Last edited by CRTGAMER on Sat May 23, 2015 9:54 pm, edited 2 times in total. CRT, thank you again for your very eclectic GameCube/Wii thread! Two games were on my "maybe" bubble that your features pushed in to a "buy" These were Wii NiGHTS and Wii Impossible Mission. NiGHTS I find beautiful and think they nailed the dream quality. The Classic Controller was not as distracting to me as to you. This game is a keeper and I wish its younger "cousin" Rodea Sky Soldier, would be published in NA (well -- and in Japan!) for even more emotive airborne action. Impossible Mission Wii, however, I had a hard time getting along with and will be trading it in for a few cents today. The non-progressive scan is a deal breaker to me and the aliased graphics give the distinct impression that this is the DS version upscaled. I'd rather buy the C64 version on the Virtual Console should it become available in NA (currently only in PAL VC). Not Sky Landers or Sky Sword but a Flight Simulator called Sky Crawlers. The game is based on the Japanese Anime movie and comic series probably most have never heard of. I have already played other Anime to flight game series, a few Macross flight games and was disappointed. One thing that really caught my eye was the development team Project Aces, the same group that made the Ace Combat series. There are three skill levels to choose from. The best choice is the Expert mode. Though the plane can oversteer and overshoot a target, FULL control is achieved with complete turns and banks, the only way to fly. I normally hate sitting thru game instructions, but the briefings add a nice realistic World War II briefing as if in a Pilot Ready Room flavor. Start off with a faint almost Scottish music tuning you to the screen. Then a shot of a reflection of an overhead projector followed by transparency overlays dropped on the screen as the lecture is carried on. The Group Commander gives the briefing professionally to the point as one would see in older War Movies. Following the briefing is a tactical interactive map showing the starting point of you air wing and the enemy locations. The models in the map play homage to military maps that use miniature models to track battalions. Press B to get a full view, the map is very nicely done! Why is it almost every Wii game, notably the Flight Games only offer the Wii motion controls? There are quite a few games that should at least offer a standard Classic Controller option. At least I found one dedicated Flight Simulator that gives me a choice. Against my better judgement, I grudgingly gave Motion Control a go. Unlike most games, the Wiimote is held by the LEFT hand and the Nunchuck is held by the RIGHT hand. I'm one of the few Wii owners that do this anyways, so I was already ahead subconsciously knowing the button placement. Think of the entire Nunchuck, not just the analog stick as the Flight stick. Pitch and Turn to fly the plane, it actually works well as a natural extension. 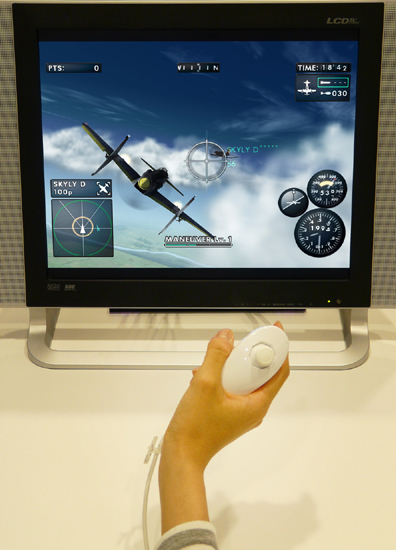 This is better then tilting the Wiimote which would distract from the pilot control feel of the game. The Remote in turn is tilted forward and backward for throttle control. 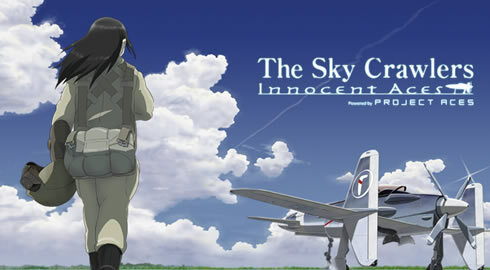 Project Aces, the internal Namco Bandai team behind the Ace Combat series, is using the Wii remote/nunchuck combination in a unique way with Sky Crawlers: Innocent Aces. You control your plane with the nunchuck and fire a mounted machine gun by pressing the Z button. The remote acts as a throttle, tilt it forward to speed up and pull it back to slow down. It sounds like Project Aces simplified the control scheme from the Ace Combat 6 flight stick peripheral and implemented into Sky Crawlers: Innocent Aces. A more traditional flight approach that is commonly used in RC models. The analog stick is used for turns and banks just like flying a Radio Control model plane. It works, but grabbing the entire Nunchuck as a Flight stick seems better as if holding a real flightstick vesus just a thumb control. If only the Nunchuck was tethered to a base, it would seem more solid as if a plane cockpit is attached underneath the controls. There is an anchor of sorts that can give a Flight Control characteristic to the Wii controls. In the endless barrage of plastic attachments for the Wii, this is probably one of the more stranger ones. As in the Classic Controller very similar in the feel. A solid control that works great and the choice for anyone who loves RC model flight. Both the Classic Controller and Gamecube controller opens up options of using adapters to utilize Playstation controllers. CRTGAMER wrote: The Gamecube Playstation controller adaptor offers a very unique capability. It allows older PS1 controllers to work including the PS1 FLIGHTSTICK, controllers that would not function in a PS2. This adds a HUGE library of unique controllers that can be used for Gamecube and GC controlled Wii games! 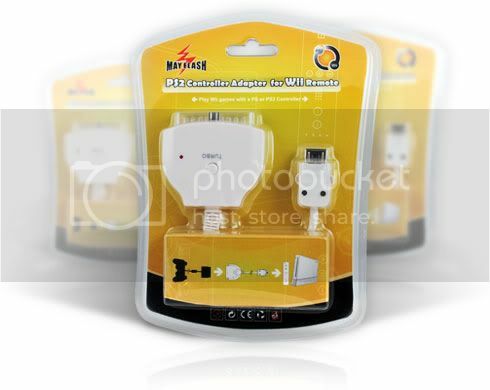 A Mayflash Classic Controller adapter also works the same way; giving additional control options for Wii Classic Controller games. I have two different style Flight Sticks that do not work in a PS2 Flight Games and only a limited amount of PS1 games. The Eagle Max and the Sony Flight Analog stick. The Eagle Max supports all Dual Shock PS1 games but no PS2 games. The SCPH1110 Flightstick supports fewer games, 25 PS1 pre Dual Shock games and only two PS2 games. This beautiful Dual Flight Control Stick begs for a decent game to give it a proper workout. The Left stick is for Turns, Diving and Climbing. This is so much better then a tiny Analog Thumb stick. Wrapping my hand around the flight handle I can really hang on for while twisting around, diving a mountain pass then side turning to get clear again. The Right Stick is used to select predetermined moves, so both hands are tied solid. The button layout cannot be customized, but once you learn each button for a given finger or thumb it really offers great control. Each stick has two thumb buttons and a primary finger trigger button. At the base of each stick is a fourth button perfect for the third or fourth finger. The right stick also has a four way Hat Switch, used for selecting targets. A lot of buttons, meanwhile keep the plane in flight, dodging the enemy. A lot of buttons that need instant access while flying. Weapon Select and Fire, Throttle, Target Lock, look around views and even the Tactical maneuvers if desired. This emphasizes the strongest point of a Flight Stick over regular controllers. 1. Both hands are always on the Flight Controls to fly. 2. Fingers and Thumbs each have dedicated buttons to control. I still can't figure out all the keys on a QWERTY keyboard thru touch typing, but have finger memorized all the "Home" buttons on the Flightsticks. Most flights deal with dogfights and bombing targets. The dogfights are really done well, a closeup battle is so much better then shooting missiles at a distant target. You really have to work at staying behind the enemy. Ground based targets are sometimes also on the move, the small PT boats are especially hard to target with the bombs. There is some variance in Sky Crawlers as well. 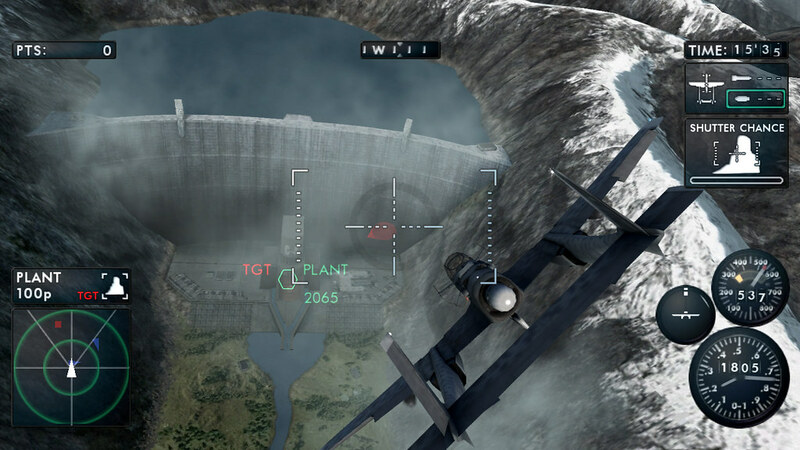 In one level, an aerial photo has to be taken of the enemy dams with a reconnaissance plane. A closeup, level and below the cliffs flight has to be achieved. After "shooting" the photo, a quick evasive maneuver is needed to avoid crashing into the Dam. There are eight evasive maneuvers built in the right stick. These allow a quick evade or turn to avoid a mountain. After pulling the right stick, hit the Z button to pull off the evasive stunt. For a real ride, try clearing the mountains without resorting to the "cheat". Get behind an Enemy Plane in Radar Range and keep the plane in your sites. A TMC bar gauge appears and fills as you get closer. Tap the X Button for an automatic maneuver behind the plane. A mini in game cutscene puts your plane directly behind the enemy. Blast away, if you start to lose the enemy, hit the Tactical Command button for another flyby. The tactical features might be shunned by PC Pilots, but its useful to use at times. The affect adds a wow factor during the quick external view, the plane going thru its aerial ballet. To really boast your skill at piloting, the Tactical features do not have to be used. One of the medals awarded is completing a mission with just straight flying. It’s a neat twist on the Ace Combat formula – a formula that already forms the core of the best arcadey aerial shooter series ever made. 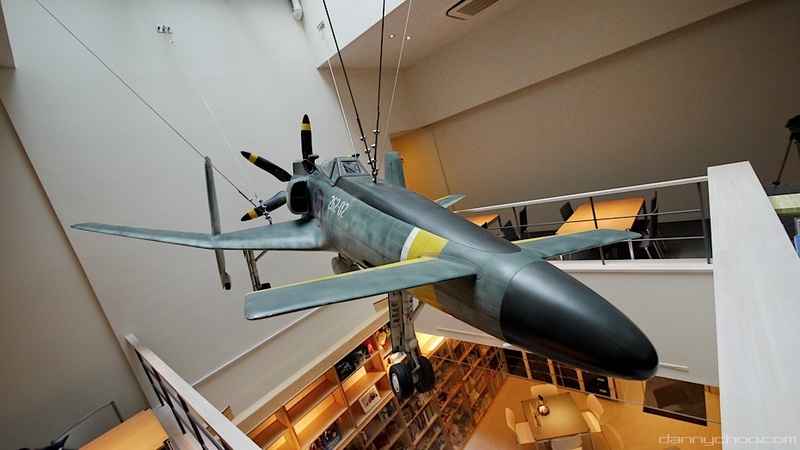 You can put your faith in Project Aces and Namco when it comes to shooting planes full of holes, even, it seems, when shackled to the 10-tonne movie licence anchor. When it comes to planes, Namco can do no wrong: not on PS2, not on PSP, not on 360, and – at last – not on Wii. If there is one Flight Sim game to get on the Wii make it this one. A nice flying game with great graphics and tight controls that allows a choice of all the controllers from Wii Motion to Classic to Gamecube and a very nice undocumented Flight Stick support. 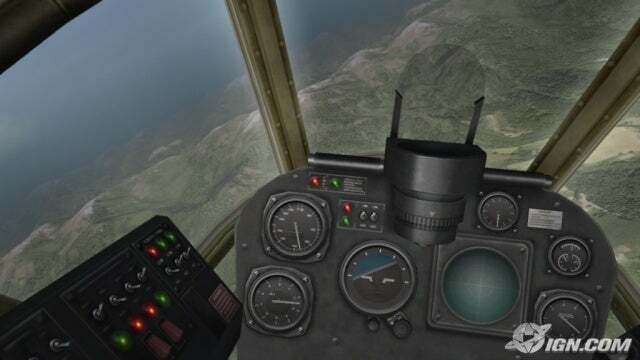 Sky Crawlers has a good mix of new and old style of Flight simulation. It includes a modern HUD with digital readouts for identifying targets, yet since there are no missiles. Close up dogfights are required for dispensing an enemy, the best of the old and new in flying a plane! Some games have a reversible cover. I guess this would be one advantage of the Eco case, you can spot part of the hidden artwork thru the holes. The Best way to fly a Flight Sim is with a Flight Stick. 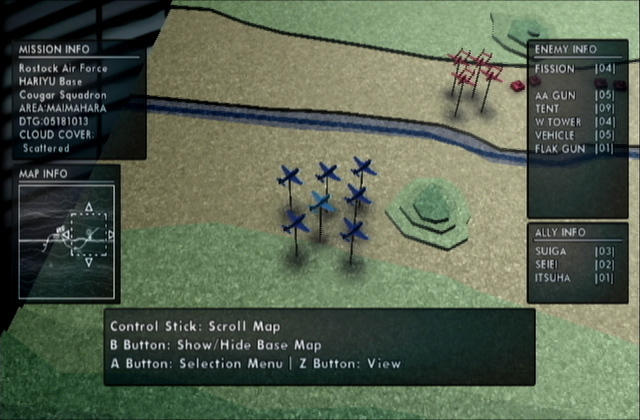 I missed out on the huge controller layout of XBox Steel Battalion, so this is really a nice discovery. Thanks to the undocumented Gamecube adapter support, the PSX SCPH-1110 game support went from 27 to over 600 games! Last edited by CRTGAMER on Fri Feb 12, 2016 12:04 pm, edited 7 times in total. Place Holder Pics for the Guide on the next page. Last edited by CRTGAMER on Wed May 02, 2012 12:39 pm, edited 2 times in total.